The Government of Telangana School Education Department would briefly issue a notification to conduct Diploma in Elementary Education Common Entrance Test (TSDEECET – 2019) for the Admissions in Diploma in Elementary Education (D.EL.Ed). Every year Department conducts the DEECET Entrance Exam. The TSDEECET 2019 Entrance Test will be conducted at the soonest possible promptly. The Details of Application Form, Eligibility, Age limit, Admission Process is mentioned below the article. TSDEECET – 2019 Entrance Test: Online applications for appearing at the Telangana State Diploma in Elementary Education Common entrance Test (TSDEECET – 2019) to be conducted by Dept. of School Education, Govt of Telangana shortly, are invited from eligible candidates who intend to take admission into two years Diploma in Elementary Education (D.EL.Ed) in Government District Institutes of Education & Training (DIETs) and Private Elementary Teacher Training Institutions in the Telangana state. The Government of Telangana publishes the TS DEECET Notification 2019 for the common entrance exam to get Admission to D.El.Ed with Two years Duration Course. This Notification is for District Institutes of Education and Training (DIET) and Private D.El.Ed Colleges. Applicants, who are eagerly waiting to apply for Admission in Telangana Institutes, may apply for this Telangana DEECET 2019 Exam. Aspirants may can apply through Online on or before the Last Date. Online applications are available now at the official website. The candidates OC, BC who have passed the Intermediate (10+2) or its equivalent with Minimum 50% marks are eligible to take the TS DEECET 2019 entrance exam. Minimum 45% marks are eligible the SC/ST/PC Aspirants who appeared for 2nd-year Inter examination can also apply for TS DEECET 2019 Exam, but they should be passed at the time of admission to the course. The Candidates should have completed 17 years of age as on 1st September of the year of admission. There is no upper age limit. Applicants must pay the fee for Rs: 350/-. The candidate’s selection will be purely based on the following rounds conducted by the SSB. The test paper shall be of the objective type in three Parts as shown below with 100 questions and with each question carrying 1 mark. Time duration is 2 hours. Log in to the official website of the TS DEECET. Go through the instructions to fill up the form in click submit the application form link. Fill all the correct details and click on submit button. Then upload (3.5*3.5) and signature (1.5 cm) and press upload. Fill the entire academic, study, preservation and personal details. Finally, click submit button, take the printout application mentioning the “Reference Id” (Registration Id). Now click here direct link from the official website. The applicants have to pay the Application fee of Rs. 350/- through Online Centers (or) E-Seva centers or Payment Gateway for TS DEECET 2019 Exam. Postulants may download their Hall Tickets online from the dates to be notified on the website. Applicants may keep viewing the website for information on dates of download of Hall Tickets. In case any applicant cannot download the Hall ticket during the dates notified for download of Hall Tickets, she/he should contact the helpline by giving the details of the Journal Number of the fee paid and the reference ID number of the application submitted. The Government of Telangana School Education Department shall declare the TS DEECET 2019 Entrance Exam results very shortly through the official website. They will declare the results along with merit list of candidates within in 45 days from the examination. Appeared candidates may check and download the results by the use of Admit Card / Hall Ticket Number. Postulants who are qualified in this exam those applicants go to the next counseling process. 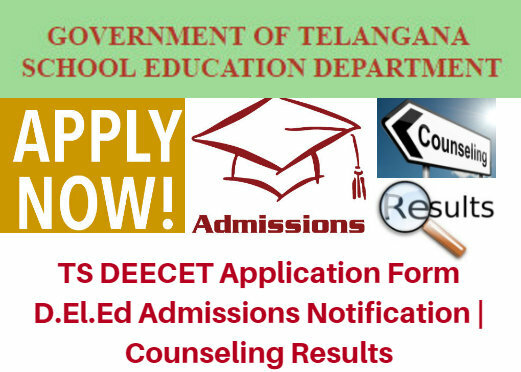 Applicants seeking admission into D.Ed courses through TS DIETCET 2019 Counselling must check the following Steps for TS DEECET Counselling Procedure 2019. The admission process based on three stages TS DEECET Web Counselling (Web Options are performed as per candidate’s choice) Seat Allotment and download of Provisional Allotment Order. Final reporting at the college after Verification of Certificates and Payment of fee. So, applicants should remember this information so that they can complete their Counselling process successfully. We suggest the aspirants to check the Counselling Centers. TS DEECET Entrance Result/Merit List 2019. Date of conduct of TSDEECET-2019 To be notified shortly. Name of The Organization: Government of Telangana School Education Department.